Concentrated fish-oil, containing an especially high dosage of Omega-3. One Omega Max 3 capsule provides an Omega-3 quantity equivalent to a fish portion. 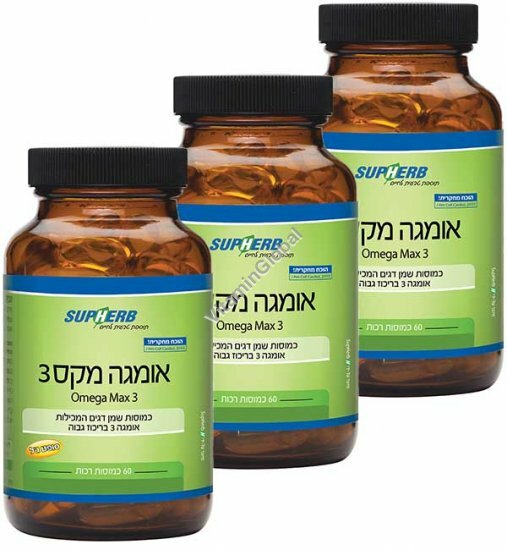 Regular taking of Omega Max 3 is necessary in conditions of heart disease, inflammatory diseases, Cerebral-Vascular Accident (stroke), Adult Diabetes, depression and decline in cognitive functioning. Directions: 1-2 capsules a day, with the meal. Available in a package of 3 bottles, containing 60 soft-gel capsules each.